Julieta Ryder, M.D. is a Board Certified Ophthalmologist and fellowship-trained Oculoplastic Surgeon. She specializes in CO2 Laser eyelid surgery and minimally invasive facial rejuvenation techniques. She joined Kellis Eye and Laser Center in 2015 and sees patients at 4 locations in Northeast Ohio. 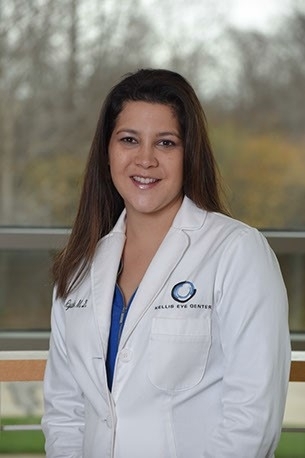 She earned her medical degree from Case Western Reserve University and completed Ophthalmology residency training at University Hospitals Eye Institute, where she cared for patients at UHHS, MetroHealth Medical Center, St Vincent’s Charity Hospital, the Louis Stokes Cleveland VA, and Free Clinic. During her residency, Dr. Ryder performed over 250 cataract surgeries and treated thousands of patients with eye conditions including traumatic eye injuries, glaucoma, and macular degeneration. To provide the expert care her patients can trust, Dr. Ryder went on to complete an Oculoplastic and Laser Facial Aesthetic Surgery fellowship with Dr. Augustine Kellis, a pioneer of CO2 laser eyelid surgery. In addition to the management of common eyelid conditions like entropion, ectropion, and ptosis, special emphasis was placed on the use of incisional and resurfacing lasers and mastering the Kellis Laser Lift blepharoplasty technique. Dr. Ryder is a trained aesthetic laser specialist and provides cosmetic resurfacing services of the eyelids, face, and body using our state of the art Halo and TRL Laser by Sciton. She is also skilled in the use of Broad Band Light and SkinTyte II, which are nonsurgical treatments with little to no downtime intended to give a more youthful appearance. Dr. Ryder is board certified by the America Academy of Ophthalmology and provides both medical and cosmetic surgery for eyelids. She is currently accepting new patients at our Chardon, Warren, Youngstown, and Canton locations. Her hospital affiliations include Lake Health Systems, UHHS Cleveland and Geauga, and Aultman in Canton.